Emmanuel Macron — an independent centrist who has never held elected office — has won a resounding victory over far-right, nationalist Marine Le Pen in the most important French presidential race in decades. According to the French Interior Ministry and multiple news outlets, Macron won with near 66 percent of the vote over Le Pen's just over 34 percent. In his victory speech outside Paris' Louvre Museum, where thousands of Macron supporters gathered, the 39-year-old vowed to bring "hope and renewed confidence" to France amid widened social rifts exposed by the election campaign. "I know the divisions in our nation that led some to extreme votes. I respect them," he declared, solemnly. "I know the anger, the anxiety, the doubts that a large number of you also expressed. It is my responsibility to hear them." Sunday's results mark a big defeat for Le Pen, a right-wing populist who had hoped to repeat the surprise victories of Donald Trump and the Brexit camp, which won last summer's referendum to take the United Kingdom out of the European Union. "We are now the second party in the country," she told supporters. "It is up to us to confront the globalist agenda of Macron." While Macron supporters waved the French tricolor flag in Paris, to the north in "Le Pen country," her supporters were disappointed and pessimistic. Noemie Willay, a day care worker, stood with her arms folded as she heard the election results while strolling through the main square in the northern French city of Lille. Willay, 20, insisted that Macron would do nothing to address big issues, including immigration and keeping France safe. She predicted terrorist attacks would continue. "They want to kill as many as possible," she said, as French security personnel walked around the square in body armor and carrying automatic weapons. "They could attack anywhere at any time." Willay said many French were unwilling to confront issues that touched on sensitive areas, such as religion and ethnicity. "The French are afraid to say what they think," she said. "That's why Macron wins." Macron, who has never held elective office, is set to become the youngest president in modern French history. His improbable path to victory has been extraordinary in that it included dispatching France's two major political parties, the Socialists and the Republicans. Macron does not have a lot of time to savor his victory. His movement, En Marche! (Onwards! ), which he created last year, does not hold a single seat in France's lower-house of parliament. If Macron hopes to govern effectively, his party needs to win as many seats as it can in legislative elections scheduled for next month. 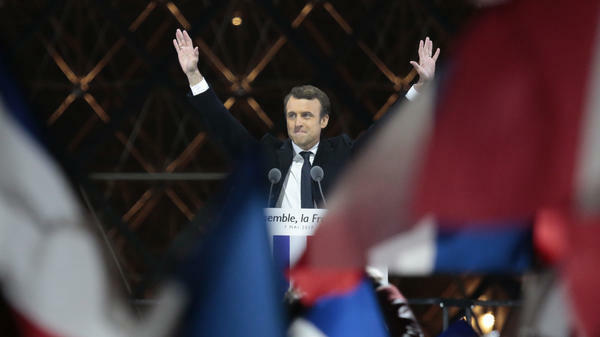 Despite Macron's inexperience, Charles Lichfield, an analyst with the Eurasia Group political risk consultancy, predicts Macron will get an electoral bump based on French political tradition and the goodwill of voters. "The French electorate has tended to provide presidents with a majority when the legislative election has been shortly after the presidential election," Lichfield said. "There's a feeling that if you've elected a president, you might as well allow them to govern." But Lichfield doesn't think Macron will win a clear legislative majority, meaning he'll have to form a coalition with moderates in France's center-right Republican Party. Macron has pledged to push reforms to the country's rigid labor market that will encourage business and investors, but could provoke union strikes. As economy minister, Macron proposed reforms that triggered months of street protests. An Ipsos survey of nearly 5,000 people found Macron beat Le Pen across many demographic categories. He won in all age groups, all levels in the workforce and from high school dropouts to people with graduate degrees. Like Donald Trump in the U.S. election and the Brexit camp in last year's U.K. referendum, Le Pen was expected to perform well in rural areas. But the Ipsos poll, which was conducted online between May 4 and 6, found Macron garnered 57 percent of support in rural areas. Le Pen, who cast herself as the champion of those who felt they'd suffered from economic globalization, won nearly 70 percent of support among those people who are the least financially secure. Corinne Mellul, who teaches political science at Catholic University of Lille, noted that although Le Pen lost, she did far better that her father, Jean-Marie Le Pen. Jean-Marie Le Pen founded the National Front in 1972. For much of its existence, the party was treated as a political pariah. When Jean-Marie advanced to the run-off in the 2002 presidential race, his candidacy provoked protests and the other political parties called on their voters to reject him. As a consequence, center-right President Jacques Chirac won a second term in a landslide with Jean-Marie Le Pen receiving less than 18 percent of the vote. By getting a little more than a third of the vote, Le Pen shows "there is a lot of anger, there's a lot of frustration, many grievances on the part of the voters," Mellul said. "I think Macron in the next five years will ignore these grievances and this anger at his own peril." The French presidential race — which has been closely watched around the world — was to some extent the latest referendum in the West on globalization and its benefits and societal costs. The race here also focused on the deeper question of what it means to be French. As Sunday began, French voters faced a stark choice. Macron, 39, is an avowed internationalist who speaks fluent English and envisions a France deeply integrated with Europe and open to the world. Among those cheering Macron's victory are officials in Brussels who work with the European Union. The E.U. is in the early stages of negotiating the exit of the United Kingdom, which is seen as damaging to the 28-member trading block, but not fatal. Le Pen had promised as president to call a referendum to pull France out of the E.U., which would have threatened to destroy the institution. The White House released a statement Sunday congratulating Macron: "We look forward to working with the new President and continuing our close cooperation with the French government." On Wednesday, the candidates faced off in a gripping televised debate that ran two and a half hours without any commercial breaks. Le Pen, who is a fiery speaker with a laser-focused message, was expected to clobber Macron, who has little political experience. Le Pen spent most of the evening on the attack, but provided few detailed solutions to France's myriad problems, which include a 23 percent youth unemployment rate and a spate of horrifying, terrorist attacks in recent two years. Both the news media and public opinion suggested Macron was the clear winner. On Friday, hackers dumped a trove of emails from Macron's campaign on the internet in an apparent attempt to damage his candidacy just ahead of Sunday's vote. But the French government warned both the media and citizens not to spread the hacked documents and abide by a traditional blackout ahead of the vote. The hacked documents did not appear to gain much traction and were not seen to have an effect on the results. Reporter Jake Cigainero contributed to this story.